A Palmetto Bluff Wedding Photographer captures the charm and elegance of a true Southern wedding. At Palmetto Bluff, past and present intertwine, and the setting is like that of an old movie that shows the splendor of the old South, like Gone With the Wind. The space creates a wedding day that could be something from a dream. In this photo, guests at a Palmetto Bluff Wedding stand about on the porch on a warm spring evening in South Carolina. 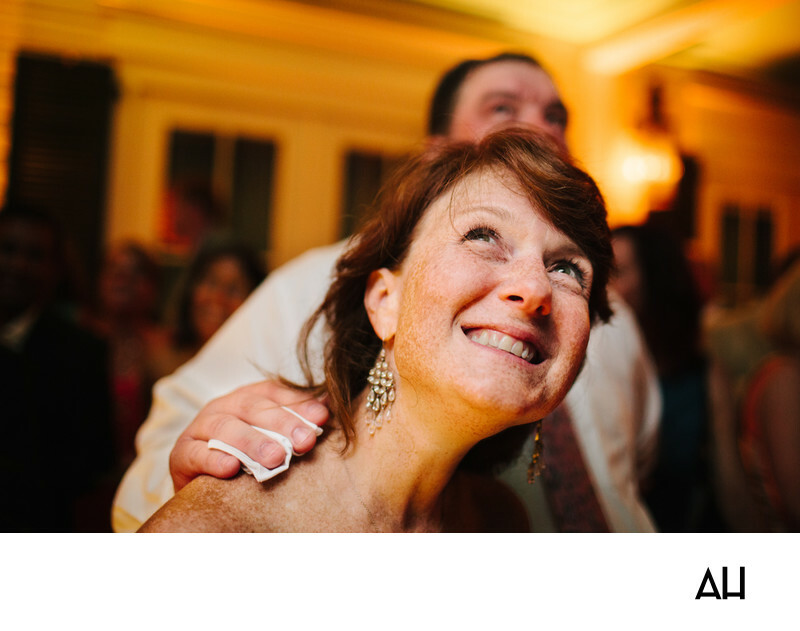 The picture highlights the happiness that a Palmetto Bluff Wedding Photographer sees as the camera flashes. This image focuses on the joyful expression of one guest. The guest’s smile reaches her eyes and lights up the natural beauty of her face. Behind her, porch lamps give off a fiery yellow glow in the background as the reception continues into the night. The images of other guests are blurry in the background as they chat with friends and participate in the festivities of the evening. Their faded figures call attention to the genuine delight of the girl at the forefront of the photo. The girl has an open, honest face, and her hair is a bit messy from dancing all evening. Another guest places a hand on her shoulder as they look up at the night sky in awe of the stars that sparkle above them. Long crystal jewels dangle from the girl’s ears, catching the moonlight. It is a scene of friendship, love, and wonder as the enchanting evening begins to wind down and guests prepare to go home.